MY FRIEND TORE HAD TO REMOVE A TOOTH. I DON’T THINK HE CRIED. MY FRIEND TORE MAKES ART WITH: PAPEPER, PENCILS, ACRYLIC AND OIL PAINTS, CANVAS, WOOD, CONCRETE AND GLASS. MY FRIEND TORE CAN DO MANY THINGS, BUT SOMETIMES HE KEEPS THEM TO HIMSELF. IS FROM NORWAY. NORWEGIANS CAN BE UNCERTAIN ABOUT THEIR FEELINGS. 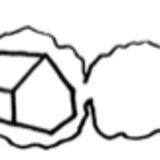 SOMETIMES THEY THINK ABOUT TROLLS. WISHES HE WAS HEALTHIER; DON’T WE ALL? HAS A SPECIAL FRIEND, MARIA. SOMETIMES THEY WEAR CLOTHES. SOMETIMES THEY DON’T. THEY TAKE PICTURES TOGETHER. 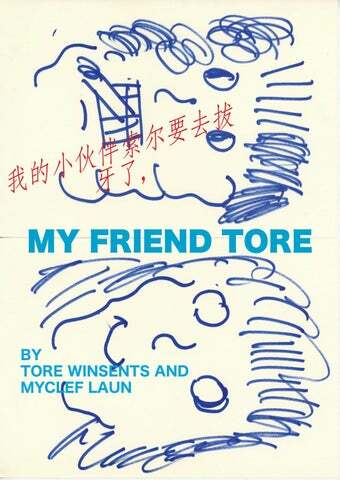 MY FRIEND TORE is a collaboration between Myclef Laun and Tore Winsents. Translation by Ken Bi.